Ted Ashby takes up the story of the Rangi’s last trip…. 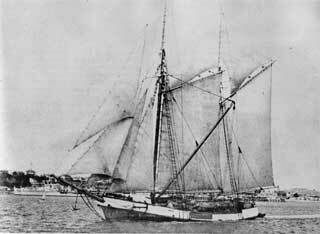 “In 1937 the Rangi was coming up from Tauranga with a load of (my father’s) logs in a fresh north-easter, and when she rounded Cape Colville the wind increased to gale force, but with a weight of logs, a buoyant load and wind astern, she was romping home making for the Motuihe Passage under lower canvas running free to port. As she was getting up abreast of the Noises a heavy gust hit her and the port chainplates on the after-shrouds carried away, opening up a nasty leak and creating a risk of her being dismasted. Peter Pederson, a really good resourceful scowman, put her over on the other gibe to take the strain off the pulled chainplates and set a course through the Rakino Passage, finally rounding up under Motutapu, where he was only partly sheltered, and dropped anchor. Here the wind inceased to a full-size gale. They carried on pumping but the water was gaining. Peter made a decision to dump some of the logs and, knowing him and knowing that he knew the risk he was taking, it certainly was a major decision. He knew she had to be lightened but he also knew, with the water in her bilges and the list she was carrying, that when he dumped logs off to the side she was listed the water would start to work back through the timbers to the other side, and once she listed that way it would rush across as she had no solid partitions to slow up the flow of water. From “Phantom Fleet. The scows and scowmen of Auckland” by Ted Ashby, published by AH and AW Reed, 1975. My father was the last person to see the crew alive when he farewelled them as they left Tauranga. 1) When the Rangi sank they sent a message ashore (in morse) and the entire crew should have been saved, but ashore everyone was too drunk to man any boats and so they never went out. 2) In “Phantom Fleet” the name Pederson is incorrect. It should have been Peter Johannsen Petersen. From Ena Watkins 4 March 1982.